With Summer here, comes gatherings and parties. Here are some good punch recipes to keep you cooled and refreshed. TOTAL TIME: Prep/Total Time: 15 min. In a punch bowl, dissolve sugar in water. Add juices and lemonade; mix well. Stir in ginger ale. If desired, top with a decorative ice mold and lemon slices. Serve immediately. Yield: 50 servings (7-1/2 quarts). TOTAL TIME: Prep/Total Time: 5 min. In a large bowl, combine the sugar, tea and drink mix. Divide into five equal batches; store in airtight containers in a cool dry place for up to 6 months. Yield: 5 batches (8-1/2 cups total). To prepare tea: Dissolve about 1-2/3 cups tea mix in 1 cup warm water. Place in a gallon container. Add cold water to measure 1 gallon. Cover and refrigerate. Yield: about 16 (1-cup) servings per batch. In a blender, cover and process the bananas, orange juice and lemonade until smooth. Remove half of the mixture and set aside. Add 1-1/2 cups warm water and 1 cup sugar to blender; blend until smooth. Place in a large freezer container. Repeat with remaining banana mixture, water and sugar; add to container. Cover and freeze until solid. One hour before serving, remove punch base from freezer. Just before serving, place in a large punch bowl. Add pineapple juice and soda; stir until well blended. Garnish with orange slices if desired. Yield: 60-70 servings (10 quarts). In a large saucepan, combine sugar and water. Cook over medium heat until sugar is dissolved, stirring occasionally. Cool. Add juices and peels to cooled sugar syrup. Cover and let stand at room temperature 1 hour. Strain syrup; cover and refrigerate. To serve, fill glasses or pitcher with equal amounts of fruit syrup and water. Add ice and serve. Yield: 12 servings. Do not use dishwashing liquid in a dishwasher, it will oversud. With the hot summer days approaching us, it is very important to stay hydrated. 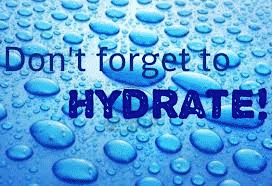 Whether you’re at work, exercising, playing sports, traveling or just lounging in the sun, it’s especially important to take precautions to stay hydrated.Many people tend to forget that during exercise we experience increased sweat loss (compared to day-to-day activities like working at a desk or watching TV).As summer arrives, make a conscious effort to increase your fluid intake to counteract the warmer temperatures and elevated humidity. Bring a reusable water bottle to work- and continuously fill it up throughout the day. Stay away from energy drinks- energy drinks contain large quantities of sugar and stimulants that can be counterproductive and dangerous especially when trying to stay hydrated. Look for a 2-pound weight loss – weigh yourself after using the bathroom in the morning. If you are two pounds less than normal and not actively trying to lose weight, you’re likely dehydrated and should drink before doing anything strenuous. 20-30 minutes before exercise- drink at least 8 oz. of water if exercising indoors and at least 12 oz. if exercising outdoors. Turn to fruit- when looking to snack, choose a fruit to enjoy. Most fruits are a great source of electrolytes and fluids. If these tips are followed, chances of becoming dehydrated will be low. Stay cool and well hydrated during the these warm summer days! Place mats strategically at each entrance to collect dirt that would otherwise be tracked in from the outside onto carpets and floors. Encoutage friends and family to wipe their feet before entering the house. In 1894, the governor of New York directed that on June 14 the Flag be displayed on all public buildings. With BJ Cigrand and Leroy Van Horn as the moving spirits, the Illinois organization, known as the American Flag Day Association, was organized for the purpose of promoting the holding of Flag Day exercises. 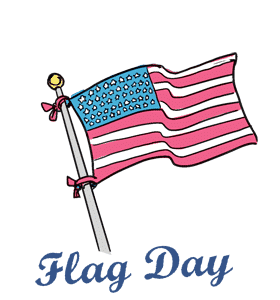 On June 14th, 1894, under the auspices of this association, the first general public school children’s celebration of Flag Day in Chicago was held in Douglas, Garfield, Humboldt, Lincoln, and Washington Parks, with more than 300,000 children participating. Inspired by these three decades of state and local celebrations, Flag Day – the anniversary of the Flag Resolution of 1777 – was officially established by the Proclamation of President Woodrow Wilson on May 30th, 1916. While Flag Day was celebrated in various communities for years after Wilson’s proclamation, it was not until August 3rd, 1949, that President Truman signed an Act of Congress designating June 14th of each year as National Flag Day. Store all household cleaning products in their original containers, with original labels intact so you’ll be able to refresh your memory with regard to directions for use, suggested precautions, and possible antidotes. Before using any new cleaning product, be sure to read the product’s label carefully. Product formulations can change, so it is also prudent to read the labels on your old standby products before using a new container. The nation’s first Father’s Day was celebrated on June 19, 1910, in the state of Washington. However, it was not until 1972–58 years after President Woodrow Wilson made Mother’s Day official–that the day honoring fathers became a nationwide holiday in the United States. On July 5, 1908, a West Virginia church sponsored the nation’s first event explicitly in honor of fathers, a Sunday sermon in memory of the 362 men who had died in the previous December’s explosions at the Fairmont Coal Company mines in Monongah, but it was a one-time commemoration and not an annual holiday. The next year, a Spokane, Washington, woman named Sonora Smart Dodd, one of six children raised by a widower, tried to establish an official equivalent to Mother’s Day for male parents. She went to local churches, the YMCA, shopkeepers and government officials to drum up support for her idea, and she was successful: Washington State celebrated the nation’s first statewide Father’s Day on June 19, 1910. Slowly, the holiday spread. In 1916, President Wilson honored the day by using telegraph signals to unfurl a flag in Spokane when he pressed a button in Washington, D.C. In 1924, President Calvin Coolidge urged state governments to observe Father’s Day. 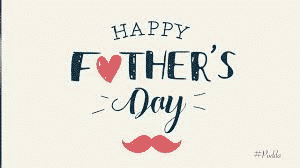 Today, the day honoring fathers is celebrated in the United States on the third Sunday of June: Father’s Day 2017 occurs on June 18; the following year, Father’s Day 2018 falls on June 17. In other countries–especially in Europe and Latin America–fathers are honored on St. Joseph’s Day, a traditional Catholic holiday that falls on March 19. Paradoxically, however, the Great Depression derailed this effort to combine and de-commercialize the holidays. Struggling retailers and advertisers redoubled their efforts to make Father’s Day a “second Christmas” for men, promoting goods such as neckties, hats, socks, pipes and tobacco, golf clubs and other sporting goods, and greeting cards. When World War II began, advertisers began to argue that celebrating Father’s Day was a way to honor American troops and support the war effort. By the end of the war, Father’s Day may not have been a federal holiday, but it was a national institution. In 1972, in the middle of a hard-fought presidential re-election campaign, Richard Nixon signed a proclamation making Father’s Day a federal holiday at last. Today, economists estimate that Americans spend more than $1 billion each year on Father’s Day gifts. Maximize lighting when cleaning or attempting to remove a stain. That way you won’t miss an important area that requires your attention. Many people wonder how to water a garden. They may struggle over questions such as, “How much water should I give my garden?” or “How often should I water a garden?” It’s really not as complicated as it seems, but there are some things that should be considered. These include the type of soil you have, what your climate or weather is like, and the types of plants you are growing. “When and how often should I water a garden?” While the general rule of thumb is about an inch or two of water each week with deep, infrequent watering as opposed to the more frequent shallow watering, this really depends on a number of factors. First, consider your soil. Sandy soil is going to hold less water than heavier clay soil. Therefore, it’s going to dry out faster while the clay-like soil will hold moisture longer (and is more susceptible to over watering). This is why amending the soil with compost is so important. Healthier soil drains better but allows for some water retention too. Applying mulch is also a good idea, reducing watering needs. 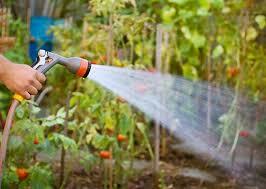 Weather conditions determine when to water garden plants as well. If it is hot and dry, for example, you’ll have to water more often. Of course, in rainy conditions, little watering is needed. Plants, too, dictate when and how often to water. Different plants have different watering needs. Larger plants need more water as do newly planted ones. Vegetables, bedding plants and many perennials have more shallow roots systems and also require more frequent watering, some daily–especially in temps over 85 F. (29 C.). Most container plants need watering on a daily basis in hot, dry conditions — sometimes twice or even three times a day. When to water gardens also includes the time of day. The most suitable time for watering is morning, which reduces evaporation, but late afternoon is okay as well provided you keep the foliage from getting wet, which can lead to fungal issues. How Much Water Should I Give My Garden Plants? Deep watering encourages deeper and stronger root growth. Therefore, watering gardens about 2 inches or so once a week is preferable. Watering more often, but less deep, only leads to weaker root growth and evaporation. Overhead sprinklers are often frowned upon, with exception to lawns, as these also lose more water to evaporation. Soaker hoses or drip irrigation is always better, going straight to the roots while keeping foliage dry. Of course, there’s also the old standby—hand watering—but since this is more time consuming, its best left for smaller garden areas and container plants. Knowing when and how to water a garden correctly can ensure a healthy growing season with lush plants. If you don’t need or like something in your house, give it away, dispose of it, or recycle it rather than having it around the house.